Government plans to derive 20 per cent of the UK's electricity from renewable sources have been rather spoiled by news from the European Union that in fact 20 per cent of all energy should be green, not just the electricity. According to the BBC, this means the UK is only committed to a quarter of the European goal, so far. It says that a forthcoming whitepaper is intended to "cover the gaps", with a fuller policy likely to be published in the autumn. Meanwhile, in Europe, the debate over how much of the overall target each country should be responsible for is still raging. 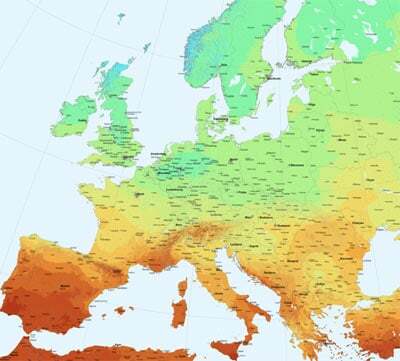 The European Commission has also published a map showing the varying solar voltaic energy potential of Europe. The map is interactive, and can be used to calculate very specifically how much energy the sun can provide in a given area. The calculations are based on "knowledge of the sun's energy, geographic distribution, the different terrain across Europe, and detailed technological analysis of the available photovoltaic technologies," according to the commission. Unsurprisingly, southern Europe, basking in the sun as it is, has rather more potential than we poor souls in the north for harnessing those solar photons and bending them to energy generating purposes. For instance, Malta has roughly twice the potential of Scotland.